Toorak is an affluent inner suburb of Melbourne, Victoria, Australia, 5 km south-east of Melbourne's Central Business District, located within the City of Stonnington local government area. Toorak recorded a population of 12,909 at the 2016 Census. The name Toorak has become synonymous with wealth and privilege, the suburb long having the reputation of being Melbourne's most elite, and ranking among the most prestigious in Australia. It has the highest average property values in Melbourne, and is one of the most expensive suburbs in Australia. It is the nation's second highest earning postcode after Point Piper in Sydney. Located on a rise on the south side (or left bank) of a bend in the Yarra River, Toorak is bordered by South Yarra, at Williams Road on the west, Malvern, at Glenferrie Road on the east, Prahran and Armadale, at Malvern Road to the south and the suburbs of Richmond, Burnley and Hawthorn on the north side of the river. The suburb's main street is considered to be Toorak Road, in which the commercial area of Toorak Village is located. Toorak is named after Toorak House, the 1849-built residence of James Jackson, a merchant. The suburb has also been a preferred location for many Consulate offices, and Residences, including China, USA, Britain, Monaco, Sweden, Turkey, and Switzerland. Toorak was named after Toorak House, an Italianate residence built by James Jackson, a merchant, in 1849. The name of the house may have originated from Woiwurrung language, with words of similar pronunciation meaning black crow or reedy swamp. From 1854 Toorak House served as the residence of the first Governor of Victoria, Captain Sir Charles Hotham KCB RN and his successors, until the completion of the present Government House (1876) in the Kings Domain. Toorak Post Office opened around June 1858. During the land boom of the 1880s, many large and elaborate mansions were erected in Toorak, often in the Italianate style. Following East Melbourne and then St Kilda, Toorak, along with Brighton, became the new favored location for the wealthy. The suburb was hit particularly hard by the 1890s economic depression and many wealthy landowners declared bankruptcy and were forced to sell. Nonetheless, the suburb remained and is still Melbourne's home of "old money". During the Interwar period, many houses were built in the Tudor revival style; many houses were also designed by society Architect Marcus Martin in the Moderne style over a Georgian building form. In the period of post-World War II prosperity, rising standards of living and land values caused Toorak to become highly sought after by a new generation of the wealthy, thought by some to be social climbers and Nouveau riche. For some of these people, the focus was simply to have the postcode of Toorak, which was SE 2 and now 3142. As a result, many of the larger mansions were demolished and large holdings were subdivided to make way for flats, townhouses and apartments. In the 1980s, larger houses in Neo-Georgian and Neo-Classical styles began to appear. While large mansions have survived in neighbouring Hawthorn, Kew and Armadale, only a few of the original 19th-century mansions in Toorak remain, due in part to the high land value. Two of the most notable are Illawarra House, which was acquired by the National Trust; and Coonac, the most expensive house in Melbourne. In Toorak, some of the old property names live on as street names or the names of blocks of flats, carved out of or built on their sites. In Toorak, 29.6 per cent of persons were employed in the industries of finance, property and business services. The Melbourne metropolitan average is 14.6 per cent. The proportion of Toorak residents aged 15 and over with a Bachelor's degree or higher is 31.0 per cent. The Melbourne metropolitan average is 13.4 per cent. Toorak has the highest percentage of children attending non-government schools in Melbourne. There are very few infants and toddlers in Toorak. The proportion of the Toorak population who are infants or toddlers (those aged up to 4 years of age) is 3.8 per cent. The Melbourne metropolitan average is 6.9%. Toorak has an unusual mix of high, low and medium-density housing, due to intense subdivision of larger lots in the 1880s, 1920s and 1960s. The predominant housing in Toorak (42.1%) is apartments, particularly walk-up flats. Single-family detached homes are also prevalent (29.6%). Some of these homes are in the form of traditional mansions or newer large residences on significant-sized estates, owned by Melbourne's wealthy and social elite. The architectural style of the mansions is predominantly Italianate and colonial. The premier residential streets of Toorak are generally considered by local real estate agents to be St. George's Road, Lansell Road, Hopetoun Road, Albany Road and Clendon Road. It is not unusual for Toorak houses to have extensive facilities, such as swimming pools and tennis courts behind solid gates and high walls to preserve the privacy of the residents. There are also extant stands of attached housing (13.5%), including terraces, which were traditionally fashionable with the middle class and later gentrified. Toorak falls within the federal electorate of Higgins. The seat of Higgins was created in 1949 and held by Harold Holt CH 1949–1967, Sir John Gorton PC GCMG AC CH 1968–1975, Roger Shipton OAM 1975–1990, Peter Costello AC 1990–2009 and Kelly O'Dwyer since 2009 (all on behalf of the Liberal Party of Australia). At State level, it mostly falls within the electorate of Malvern (currently held by the Liberals' Michael O'Brien), with the western part of the suburb falling within the electorate of Prahran (currently held by Sam Hibbins on behalf the Australian Greens). At local council level, Toorak falls within the City of Stonnington. Toorak has historically voted for conservative political parties. The Liberal Party retained the seat of Malvern in the 2018 State Election, although there was a 10.1% swing to the Australian Labour Party. The Toorak Village is a strip of shops and cafes, located centrally in Toorak Road. Saint John's Anglican Church, an 1862 Gothic Revival bluestone church, designed by William Wardell, dominates the skyline of Toorak, with a large tower including a peal of bells and a distinctive sandstone broach spire. Saint John's, Toorak is one of the most popular wedding venue churches in Australia. The Wesleyan Church (1877), formerly on the corner of Toorak and Williams Roads, was illegally demolished in 1990 by developers and later replaced by a block of flats. Schools in Toorak include St Catherine's School, Loreto Mandeville Hall, St Kevin's College, Glamorgan (now Toorak Campus, the junior school of Geelong Grammar School) and Toorak Central School (1890). The Royal South Yarra Lawn Tennis Club is located in Toorak. Kooyong Stadium, former home of the Australian Open, is located on Glenferrie Road. The most popular form of transport in Toorak is the automobile. CityLink runs along north eastern Toorak, though there are no interchanges within the suburb, although there is access to the freeway via MacRobertson Bridge and interchanges at Burnley. Main arterials running north-south are Williams Road (at the eastern boundary), Grange Road, Orrong Road, St Georges Road and Kooyong Road. The east-west arterials include Alexandra Avenue (at the northern boundary), Toorak Road (which runs midway through the suburb) and Malvern Road (at the southern boundary). Alexandra Avenue becomes St Georges Road and both along with Grange Road feed onto the MacRobertson Bridge, Toorak's main river crossing. Toorak's road planning is an example of street hierarchy. As a result, there are numerous quiet pedestrian streets. However, traffic congestion is an increasing problem along Toorak Road and Williams Roads. There is limited street parking along the main roads with just a couple of multi-storey car parks and parking lots within proximity of the main Toorak Road shopping strip. There are no level crossings in Toorak. There is a popular culture perception of Sport utility vehicle as status symbol (controversial for their luxury use, rather than for their off-road abilities) and this has been associated with the suburb of Toorak, such that in popular Australian culture, terms such as Toorak tractor, Toorak taxi, Toorak tank, or Toorak truck have become well established in Australian slang as pejoratives. An example of this was an episode of the popular program Top Gear Australia, aired on SBS TV, in which the presenters, tongue-in-cheek, drove a $200,000 tractor along Toorak Road. Toorak's only railway station is Heyington, on the Glen Waverley line, which crosses the Yarra from Richmond on the Heyington Railway Bridge, to the suburb's north. Despite its name, Toorak railway station is located in Armadale. The Pakenham, Frankston and Cranbourne railway line group to which this station belongs runs close to Toorak's southern boundary. Other nearby stations include Hawksburn, in South Yarra and Kooyong, in Kooyong. Trams have run down Toorak Road since 1888. Route 58 runs along Toorak Road to Glenferrie Road, at the suburb's eastern boundary. Route 72 runs along Malvern Road, the suburb's southern boundary. Cycling facilities are poor, with few marked on road lanes. MacRobertson Bridge and Gardiners Creek pedestrian bridge, however, the bridge provides pedestrians access to the Main Yarra Trail and shared bicycle and pedestrian paths in nearby Burnley. Pedestrians are serviced by an extensive network of footpaths and pedestrian crossings. City of Malvern - Toorak was previously within this former local government area. City of Prahran - Toorak was previously within this former local government area. ^ Australian Bureau of Statistics (27 June 2017). "Toorak (State Suburb)". 2016 Census QuickStats. Retrieved 21 September 2017. ^ "Local Names". Malvern Historical Society. Retrieved 15 June 2016. ^ "Post Office List". Premier Postal History. Archived from the original on 10 May 2008. Retrieved 11 April 2008. ^ "42 Wallace Avenue, Toorak, Statement of Significance". Heritage Council Victoria. ^ Gough, Deborah (21 November 2002). "Toorak's grandest gets new owner". The Age. Melbourne. Retrieved 15 June 2016. ^ "Toorak Suburb Profile & Demographics". propertyDATA.com.au. Retrieved 15 June 2016. ^ "Victoria Votes, Results, Electorate: Malvern". Australian Broadcasting Corporation. 2018. ^ Hale, Elini (28 December 2008). "Most drivers want a city 4WD ban". Herald Sun. ^ Stevens, Mike (3 October 2008). "Top Gear Australia's Take On The Toorak Tractor". The Motor Report. Retrieved 15 June 2016. ^ Ziffer, Daniel (18 May 2007). "Potter star down under". The Age. Melbourne. p. 6. Retrieved 7 October 2007. ^ Yaxley, Louise (18 November 2002). "Senate focuses on Telstra chief's mobile coverage". PM. ABC Radio National. Retrieved 15 June 2016. ^ Rindfleisch, Tony (8 April 2007). "Magpie flies to ritzy Toorak". Herald Sun. Melbourne. Retrieved 7 October 2007. ^ Warner, Michael (22 November 2007). "We reveal AFL boss Andrew Demetriou's $7m Toorak base". Herald Sun. Melbourne. The City of Stonnington is a local government area located within the metropolitan area of Melbourne, Australia. It comprises the inner south-eastern suburbs, between 3 and 13 km from the Melbourne CBD. The city covers an area of 25.6 km2 (9.9 sq mi) and includes the suburbs of South Yarra, Prahran, Windsor, Toorak, Armadale, Kooyong, Glen Iris, Malvern and Malvern East. Hawthorn East is an inner suburb of Melbourne, Victoria, Australia, 7 km east of Melbourne's Central Business District. Its local government area is the City of Boroondara. At the 2016 Census, Hawthorn East had a population of 14,321. Armadale is an inner suburb of Melbourne, Victoria, Australia, 7 km south-east of Melbourne's Central Business District, located within the City of Stonnington local government area. Armadale recorded a population of 9,054 at the 2016 Census. Malvern (/ˈmɔːlvən/) is an inner suburb of Melbourne, Victoria, Australia, 8 km south-east of Melbourne's Central Business District, located within the City of Stonnington local government area. Malvern recorded a population of 10,066 at the 2016 Census. South Yarra is an inner suburb of Melbourne, Victoria, Australia, 4 km south-east of Melbourne's Central Business District, located within the Cities of Melbourne and Stonnington local government areas. South Yarra recorded a population of 25,147 at the 2016 Census. Hawksburn railway station is located on the Pakenham, Cranbourne and Frankston lines, in Victoria, Australia. It opened on 7 May 1879, and serves the south-eastern Melbourne suburb of South Yarra. Kooyong railway station is located on the Glen Waverley line in Victoria, Australia. It serves the eastern Melbourne suburb of Kooyong opening on 24 March 1890. The Division of Higgins is an Australian Electoral Division in Victoria for the Australian House of Representatives. 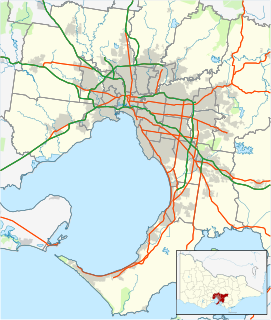 The division covers 40 km2 (15 sq mi) in Melbourne's south-eastern suburbs. The main suburbs include Armadale, Ashburton, Kooyong, Malvern, Malvern East, Prahran and Toorak along with parts of Carnegie, Glen Iris, Hughesdale, Murrumbeena, South Yarra and Windsor. Glenferrie Road is a major north–south thoroughfare in Melbourne, Australia. The electoral district of Malvern is an electorate of the Victorian Legislative Assembly. It is named for the suburb of Malvern and also includes Malvern East, Armadale, Kooyong and parts of Glen Iris and Toorak. Malvern tram depot is located in Coldblo Road, Armadale, Victoria, a suburb of Stonnington, Australia. Operated by Yarra Trams, it is one of eight tram depots on the Melbourne tram network. Gardiners Creek, originally known as Kooyongkoot Creek, is a waterway in the eastern suburbs of Melbourne, and part of the Yarra River catchment. The City of Malvern was a local government area about 9 kilometres (6 mi) southeast of Melbourne, the state capital of Victoria, Australia. The city covered an area of 15.88 square kilometres (6.13 sq mi), and existed from 1856 until 1994, when it was merged with the City of Prahran to create the City of Stonnington. The City of Prahran was a local government area about 5 kilometres (3 mi) southeast of Melbourne, the state capital of Victoria, Australia. The city covered an area of 9.55 square kilometres (3.69 sq mi), and existed from 1855 until 1994, when it was merged with the City of Malvern to create the City of Stonnington. Malvern Presbyterian Church is located in Victoria, Australia. Opened in 1886, it was the first Presbyterian Church to be founded in the City of Malvern and is now within Stonnington, a metropolitan area of Melbourne. Melbourne tram route 58 is operated by Yarra Trams on the Melbourne tram network. It operates from West Coburg to Toorak. The 18.0 kilometre route is operated by Z3, B2 and D1 class trams from Essendon and Malvern depots. The route began operating on 1 May 2017. Crittenden's was a chain of grocery stores and liquor outlets operating in Melbourne, Australia, in the 20th century. The first store opened in Malvern in 1917 and the firm went on to have a total of 7 retail outlets, mostly in the south-eastern suburbs. The business was bought out by Myer in 1982.